Just returned from the week in Cadiz. Enjoyed the city and the apartment. Very vell appointed and extremely quiet, despite the fact that it is in the center of the shopping area next to the market and has 3 ever going restaurants right across the entrance to the building. The shower was a bit tight for my husband, and the stairs offered a good cardio and legs workout, but nothing to spoil the impression of the apartment. The owner is very helpful. An apartment with a smile on its face! Lovely, comfortable apartment with genuine home personality....every bit worth climbing the stairs to! And then topped by a terrace with magnificent views across the city to the ocean. Right in the centre of this unique, precious city, whose comings and goings and gentle workaday hum you can watch and listen to. Everything....restaurants, shops, markets, museums, beaches...within walking distance. Completely unstressed, smooth and friendly arrival and departure arrangements and all required facilities, furniture and equipment in the apartment. We wished we could have stayed longer! 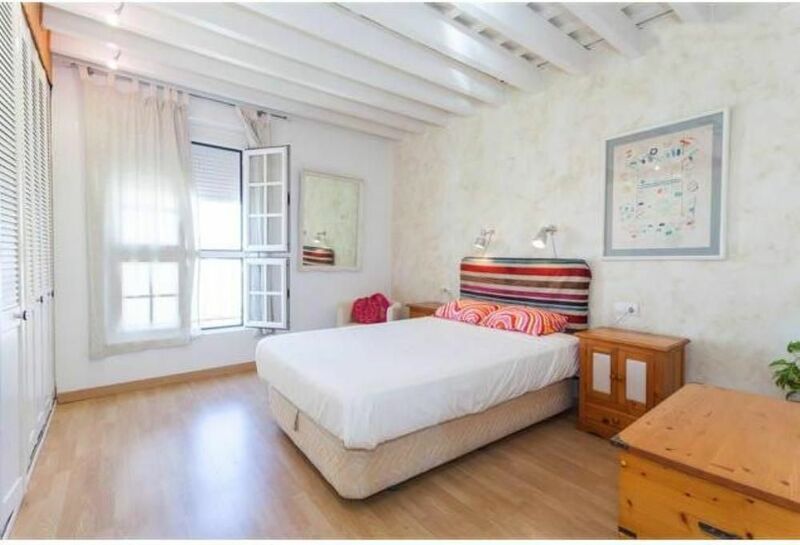 Lovely centrally located apartment with access to a roof terrace. My wife and I very recently stayed for one week and found the apartment spacious and very comfortable. It has lots of character and is nicely furnished. There was a smooth handover of the keys on arrival and a bottle of a local wine in the fridge. The kitchen also had plenty of the basic foodstuffs for self-catering, which we did on several occasions after visiting the wonderful local fish and food market nearby. The apartment is situated overlooking a square of flower sellers, which is always lively with lots of good eateries. The owner Pepa was also very helpful when we needed tickets printing for an event and responded promptly to my texts. The apartment is on the fourth floor with no lift but the climb got easier over the week and counteracted moments of overindulgence! Highly recommended and we would definitely stay there again. 5 night stay for the 2 of us (son joined us for 2 nights). Very comfortable flat in a great location adjacent to the fantastic central market and numerous bars/restaurants. Well equipped kitchen, good wi-fi, and access to the roof terrace. Overall very enjoyable - the owner (Pepa) is very helpful. We tried a couple of the recommended restaurants and they were indeed very good. Car parking in Cadiz is a bit of an issue (and expensive) so unless you're touring best left at home - and Cadiz is small enough to wander around on foot. Pepa met us at the apartment after arriving by train from Jerez. She guided us through all the facilities and recommended places to eat, drink and see. We took up those suggestions and enjoyed her tips. The apartment was very clean, comfortable furniture and beds, well equipped kitchen, where we cooked fresh food from the market, just outside the front door. We enjoyed the spectacular views from from the terraces. Pepa even e-mailed us answers to some of our questions, and the computer is at your disposal with free use. "Perfect location in THE center of Cadiz. Cadiz is à beautful Town and THE appartement is Cosy and correspondent with THE foto s. We had à good. Time there."